If one is to believe contemporary historians, the South never had a chance. Many allege that the Confederacy lost the Civil War because of internal division or civilian disaffection; others point to flawed military strategy or ambivalence over slavery. But, argues distinguished historian Gary Gallagher, we should not ask why the Confederacy collapsed so soon but rather how it lasted so long. In The Confederate War he reexamines the Confederate experience through the actions and words of the people who lived it to show how the home front responded to the war, endured great hardships, and assembled armies that fought with tremendous spirit and determination. Gallagher's portrait highlights a powerful sense of Confederate patriotism and unity in the face of a determined adversary. Drawing on letters, diaries, and newspapers of the day, he shows that Southerners held not only an unflagging belief in their way of life, which sustained them to the bitter end, but also a widespread expectation of victory and a strong popular will closely attuned to military events. In fact, the army's "offensive-defensive" strategy came remarkably close to triumph, claims Gallagher-in contrast to the many historians who believe that a more purely defensive strategy or a guerrilla resistance could have won the war for the South. To understand why the South lost, Gallagher says we need look no further than the war itself: after a long struggle that brought enormous loss of life and property, Southerners finally realized that they had been beaten on the battlefield. Gallagher's interpretation of the Confederates and their cause boldly challenges current historical thinking and invites readers to reconsider their own conceptions of the American Civil War. The Confederate War is a significant and thought-provoking addition to the current body of Civil War literature. Gallagher has returned the focus of the war to the theater in which it was decided--military operations. In doing do, he demonstrates the enormous human, financial and material investment that white Southerners put into the struggle for independence. Solidly researched and sharply argued, The Confederate War cannot easily be dismissed by the 'internal causes' historians. Consequently, it is likely to rekindle debate among both academics and popularizers, which is all to the good, particularly in the current stifling climate of political.--Richard F. Welch "America's Civil War "
An important book... The Confederate War is certain to cause controversy. For Gallagher dares to suggest that, despite, 'moral disapprobation' prevalent in many histories about the conflict over the past half-century, the stark fact remains that 'a majority of white southerners steadfastly supported their nascent republic, and that Confederate arms more than once almost persuaded the North that the price of subduing the rebellious states would be too high'... 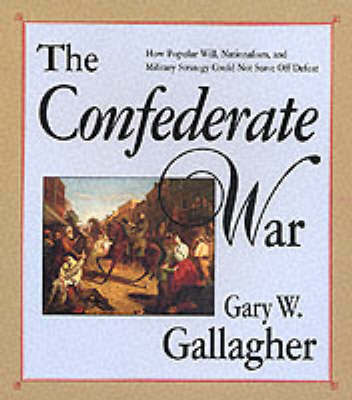 Using published evidence from Confederate diarists, soldiers, statesmen, and newspapers--evidence which by omission or intent seldom seems to find its way into recent Civil War histories--Gallagher makes a compelling case for Confederate unity. The Confederacy did not fall to pieces after Gettysburg; a 'mass of testimony' suggests that Southerners thought the war winnable until virtually the end... Thorough reassessments of the Confederacy and of the interpretations of it have long been overdue, and Gary W. Gallagher succeeds in his initial attempt to rebalance historical portrayals of the Civil War South.--B. Anthony Gannon "Register of the Kentucky Historical Society "
The Confederate War is an impressive volume. The arguments which Gallagher employs to support his central thesis are well constructed and quite persuasive. Gallagher also relies on a wide array of Confederate voices from the past to substantiate his case and this makes for an interesting study. Moreover, Gallagher's extensive review of the literature is incisive and most informative. The Confederate War should provide good reading for all students of Confederate nationalism and will generate lively debate among historians of the American Civil War for years to come.--Bruce Cauthen "Nation and Nationalism "